Veterinary medicine has changed quite a bit in the last decade with the advent of alternative medicine, three year vaccine protocols, raw food diets, wellness exams, specialty clinics, and other changes. 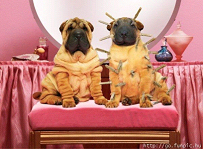 I’ve always tried to advise clients based on my experience with my own dogs, keeping current with the veterinary literature, clinical experience with all the dogs in the practice, new information available on the Internet and talking with colleagues and specialists. I still give my dog’s annual vaccinations which I have been doing for 26 years with no adverse consequences, I know of. I still feed good quality commercial dog food from the bag without any supplements. Whether good or bad our profession is becoming industry driven with veterinary product suppliers and companies telling us how to practice. Special interest groups are also getting into the act of telling us how we should vaccinate and feed our client’s pets. I’m not saying all this information is bad but we need to base how we practice on our experience with large numbers of pets and not just on the opinions and advice of others. The media would have you believe there is a definitive link between vaccination and disease. Nothing in the veterinary literature has demonstrated this in any way in dogs and vaccine-related sarcomas (a type of cancer) in cats occurs rarely. No evidence exists that raw food diets are any better than commercial dry food diets and actually some articles in the veterinary literature have documented bacterial contamination of raw food diets with dire consequences. Duration of immunity studies do suggest that for many individuals vaccinations can be given every 3 years in most individuals. My experience with vaccine titers would indicate this does not hold true for all dogs. The popular media would tell you that cancer incidence has increased due to over-vaccination, needless drug therapy, use of flea, tick, and heartworm products. Yet newer information is revealing the genetic link to cancer and gives us the hope of selecting against cancer by wise breeding programs and genetic screening programs as well as better, more effective cancer treatments. The Internet has been a plus and a minus. Good, helpful information is readily available — so is reckless, opinionated, potentially harmful material. Good discernment is very important to differentiate between the two and there is a danger in accepting Internet material as gospel truth. I thought you would like to see the article that started the whole thing. 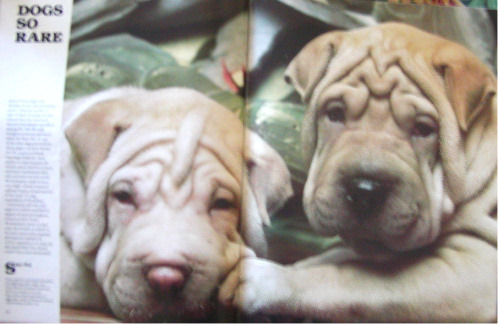 This is the Matgo Law “plea” to save the Chinese Shar-Pei from the Dogs Magazine April. 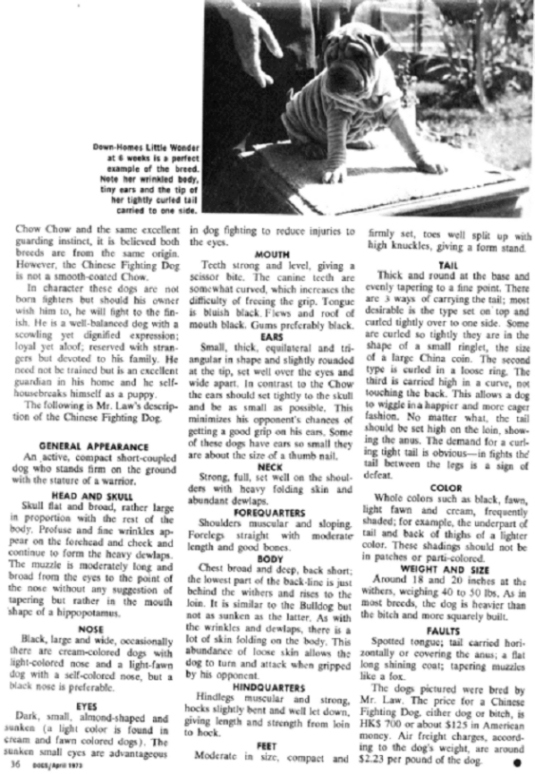 1972 issue written by Marjorie Farnsworth. 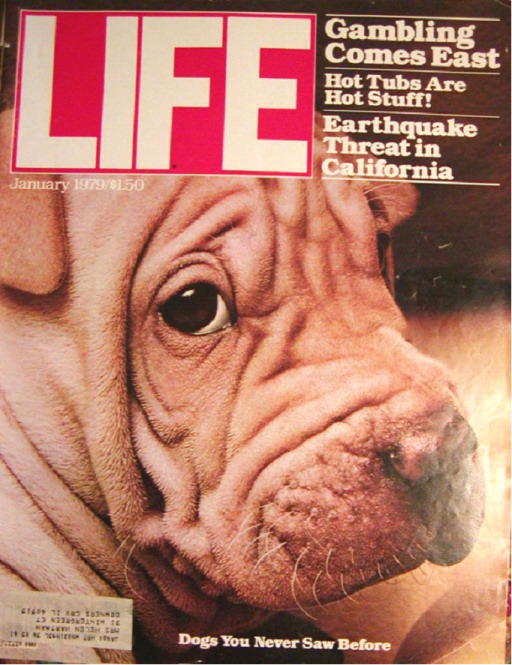 Another piece of Shar-Pei memorabilia is the Life Magazine January, 1979 issue. 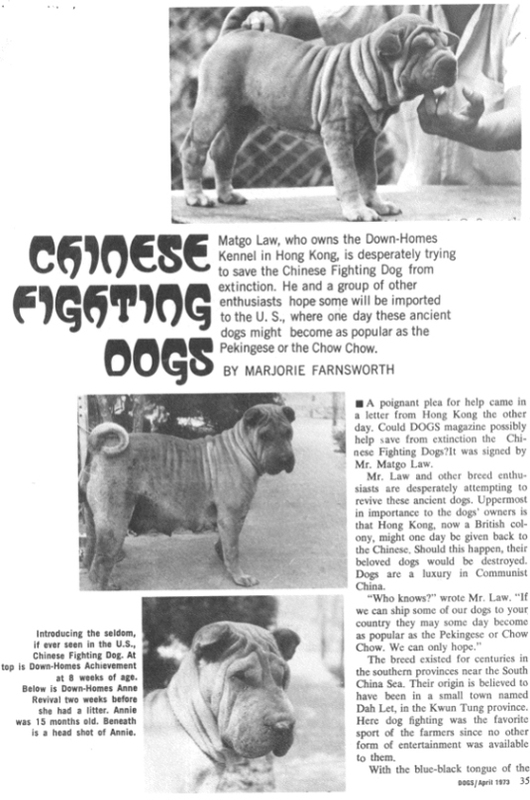 This issue featured several rare dog breeds but the Chinese Shar-Pei received premium billing.